To project how much food can be produced in the future, researchers use agricultural models that estimate crop yield, or how much of a crop can be produced in a certain amount of space. These models take into account factors like climate and weather variability, irrigation, fertilizer, and soil type. A new study published in the journal Nature Communications shows that the type of soil used in such a model can often outweigh the effects of weather variability—such as year to year changes in rainfall and temperature. 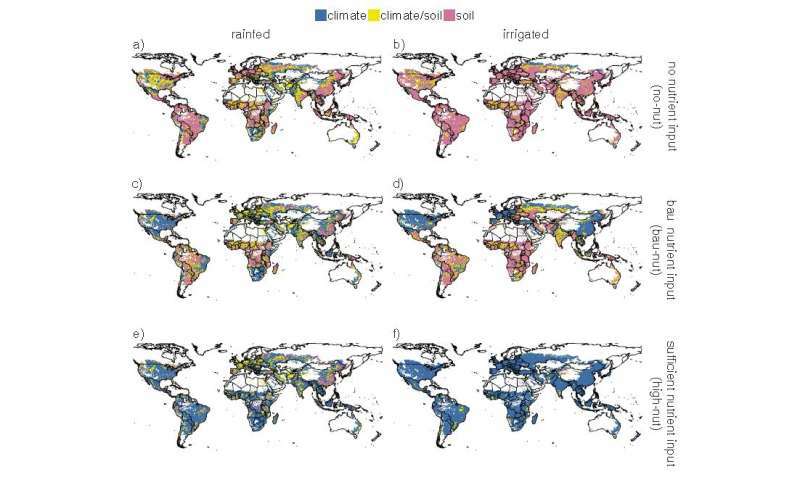 The study is the first global assessment of the importance of soils in global crop models. In particular, it shows that for yield projections in regions that use little fertilizer or irrigation—often poorer regions with many small farms—crop yield variability related to soil type can be larger than yield variability due to weather. In places where farmers use a large amount of fertilizer, the impact of soil type was smaller. "In extreme cases, climate change impacts on yield can be either negative or positive depending on the soil type chosen for the simulation. This has big implications for any recommended changes in crop and soil management to better adapt to future climate impacts," says IIASA and LMU Munich researcher Christian Folberth, who led the study. "In crop models, as in reality, soils have the capacity to buffer or amplify climate impacts, for example through the provision of water during the early stages of a drought. Generally, when global crop modelers use soil data, only one soil type in each location (or grid cell) is used, even though there may be more than 30 different soil types occurring in that location according to the soil dataset. Since we do not know which soil is cultivated, and which crops are grown on which soils, there is a large uncertainty associated with the choice of the soil used in the simulation. So far, since only one soil would be simulated, this uncertainty has not been quantified at the global level," explains study co-author Marijn van der Velde, from the European Commission's Joint Research Centre (JRC). In addition, the researchers say, global crop models often do not include soil management for climate resilience, nutrient management, or erosion control, all factors that can affect yield. "This study shows that soils contribute significant uncertainty to our models, besides the uncertainty arising from the models themselves and climate data. The difference is that reducing the uncertainty about climate is a very difficult task, but reducing the uncertainty from soil type is something we can do quickly with a relatively low cost," says IIASA Ecosystems Services and Management Program Director Michael Obersteiner. "This study gives decision makers a clear call to invest in improved soil observations." The findings also underscore that most uncertainty centers around regions that are potentially the most vulnerable to climate change impacts on food production. The researchers say that further research is needed to add detailed soil and cropland data to global climate and crop production models.